PAUL SQUIRE PHOTO | Life flourishes in what’s now charred forest in Manorville, where the Wildfire of 2012 destroyed homes and property. The charred and soot-covered Kawasaki motorcycle sat propped against piles of other burned debris next to a driveway on Oakwood Drive in Manorville. It was a classic, a 1985 454 Limited bike, one of George Moretti’s prized possessions. The motorcycle is useless now, damaged beyond repair nearly a year ago in the massive wildfire that swept through this neighborhood. The house where he and his family had lived for 25 years — and everything inside it — were destroyed by the flames and smoke that jumped out from the Pine Barrens behind his property. “The whole house was a loss except for the framework,” he said, sitting outside his trailer this week, watching as contractors worked on the shell of his house. He can’t get what happened out of his mind. The Wildfire of 2012 burned more than 1,100 acres of the Pine Barrens in Manorville and Calverton last April 9. The seventh largest wildfire in state history started on Brookhaven National Laboratory’s Upton property and, fueled by strong winds and dry tinder on the forest floor, quickly spread south and east into the Riverhead Town section of Manorville. The blaze raged for more than 24 hours, destroying homes, injuring local firefighters and forcing the evacuation of nearby residents as the flames drew ever closer to residential neighborhoods. Dozens of fire departments helped bring the inferno under control. Since then, fire departments across Suffolk County have been reviewing their procedures, and environmental experts and officials say plans are in the works to create new procedures for fighting wildfires and adding additional resources like water wells to the area. A Suffolk County task force found that “communications was the major issue” in the local response to the fire, said County Executive Steve Bellone. PAUL SQUIRE PHOTO | A 1985 Kawasaki 454 Limited bike that burned in last year’s wildfire. But neighboring fire departments, which often work together, all said they have taken steps to smooth out how they manage their resources. The Manorville Fire Department, which took the lead, was most affected by the blaze. It lost a brush truck — an off-road vehicle designed to fight forest fires — when flames surrounded it in the Pine Barrens and volunteers had to ditch it. Some were hurt and one suffered severe burns. A new brush truck is being built for the department, fire officials said, and the injured firefighters have recovered. With wildfires more likely this time of year, the Manorville department has also purchased a six-wheel ATV equipped with a hose to fight “spot” brush fires, fire officials said. 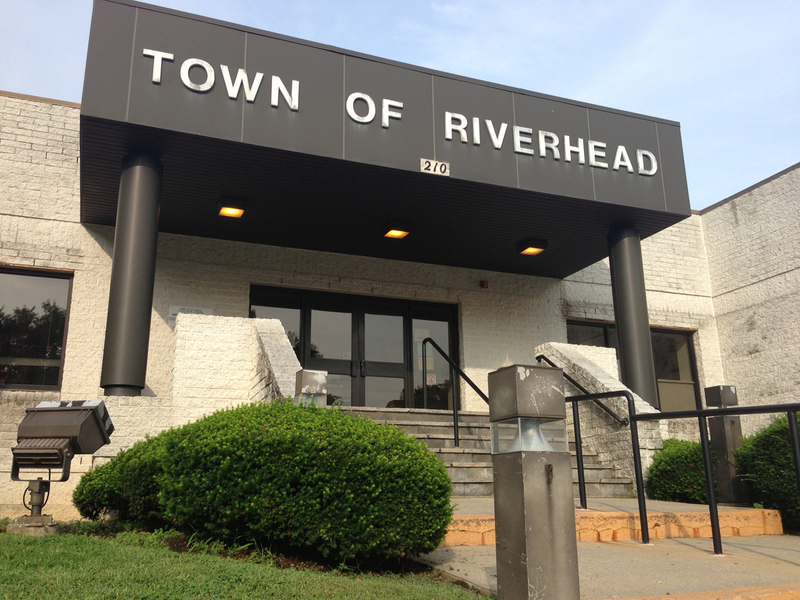 Riverhead Fire Department officials have been reviewing their plans for helping other departments, said second assistant chief Kevin Brooks. A few weeks ago, Riverhead chiefs met with chiefs from Manorville, Ridge, Wading River, Yaphank and Rocky Point departments to go over “mutual aid” procedures. Last year, the Riverhead department raced to three different locations to fight the fire, one at the Brookhaven National Lab property, one in Manorville and another on Grumman Boulevard in Calverton. The spread-out locations made it even more challenging for firefighters to coordinate their efforts, Mr. Brooks said. “It was a difficult one from a command standpoint because it was in three different jurisdictions,” he said. The Riverhead department’s volunteers are trained on brush truck safety and how to drive the vehicles, Mr. Brooks said, adding that some departments were considering covering trucks to prevent injuries from falling branches. On the whole though, Mr. Brooks says the Riverhead Fire Department can handle another wildfire. Fire departments from farther east also learned from the wildfire. Jamesport firefighters spent 29 hours working in shifts to combat the flames. First assistant chief Sean McCabe said the department has since “beefed up [its] response to these types of incidents. Since the wildfire, Suffolk County officials have been working on installing fire suppression wells in the Manorville area. Bill Faulk, a former county legislative aide who now works for Brookhaven Town, said the county’s well-drilling unit has put the equipment needed for the project out to bid and will have the first well drilled in early May. PAUL SQUIRE PHOTO | Volunteer firemen fighting the wildfires in Manorville last year. The wells will give firefighters access to water in neighborhoods that don’t have fire hydrants. The county will ultimately drill four or five wells this year, with another four or five planned between Brookhaven and Riverhead Towns, he said. Richard Amper, executive director of the Pine Barrens Society environmental group, said the wells pose no threat to the area’s ecosystem. But he said the best way to prevent future fires is to use controlled burns to clear out smaller sections of the forest, something the county and state are looking into. But because the Pine Barrens are near suburban communities, fires have been “suppressed regularly in the interest of protecting public health and safety,” he said. This leads to incidents like last year, when a wealth of tinder sparked and grew into an out-of-control wildfire in moments. Mr. Amper said the area of the Pine Barrens that burned, now littered with the skeletons of charred trees and small patches of brush, is recovering as expected. He said officials are planning to selectively burn 1,500 to 2,000 acres of the Pine Barrens’ 105,000 acres each year to limit the chance of large wildfires in the future. Unlike last year’s wildfire, these burns would not occur all at once but would be conducted only under the best conditions in small, 20-acre increments, Mr. Amper said. New York State Central Pine Barrens Commission executive director John Pavacic said the commission is “taking a fresh look” at updating its fire management plan. The group is also working to educate residents on how to limit wildfire damage by protecting their homes. The commission will meet with the Flanders Riverside Northampton Community Association next week to teach good fire habits, like keeping firewood away from the side of the house. “That’s our first foray into getting out into the community,” Mr. Pavacic said. The commission will also host its first springtime fire academy for firefighters at the Brookhaven National Lab property next week geared toward prescribed fires and prescribed fire management, he said. Ultimately, the Manorville wildfire served as a wake-up call to local fire departments and government officials. The Suffolk County Arson Squad and the state Department of Environmental Conservation have labeled the wildfire as “intentionally set,” though officials couldn’t be reached to give an update on the investigation. Suffolk County police have offered a $10,000 reward for information leading to an arrest. Some residents who lost their property to the flames have recovered. But most others, like Mr. Moretti and his family, are still feeling the effects. Paul Dill lost a pool house at his Wading River Manor Road residence, as firefighters used water from his pool to put out the fire and beat back the flames. His driveway still bears scorch marks and a nearby fence is burned to a crisp. Mr. Dill said he has since filled in the pool and demolished the pool house. “All things being equal, because of taxes and everything, we didn’t rebuild,” he said. He said he and his wife were fortunate not to lose their home and have done their best to move on. Next door, Mr. Dill’s neighbor Neal Coleman lost tens of thousands of dollars in equipment that wasn’t covered by his insurance. Thankfully, Mr. Coleman said, his house was spared when the wind shifted just before the fire reached it. On Oakwood Drive, Ray and Jane Kreiger were also lucky. They lost the trees in their backyard but the house was untouched. “Fortunately, we didn’t lose anything that was sentimental or valuable,” Mr. Kreiger said. The couple credited firefighters for drawing the line on their street and saving many homes, including theirs. As for the aftermath, the stumps of the burned trees on their property were pulled out only recently, after Mr. Kreiger and his son rented a lift, he said. “We’re still cleaning up,” he said, adding the family is still waiting for payment on some insurance claims. But not everyone has recovered yet. Stanley Krupski, who lost his repair shop on Wading River Manor Road to the fire has been battling insurance companies to get his property repaired. “That was my life savings in the tools and parts and everything,” he said. A year later, and he’s no closer to rebuilding his shop. He said he was “disappointed” by politicians who came to stand on his property after the wildfire and voice their support but have done little to help him in his struggle. “It was really disappointing,” he said. Like Mr. Krupski, the Morettis down the road have some waiting to do. Their new house was supposed to be ready a few months ago, but Hurricane Sandy and this winter’s blizzards pushed back construction. Problems with the insurance and service companies have also caused headaches for Mr. Moretti. He said he hopes the house will be finished by the end of April. It has to be, he said; the family isn’t allowed to stay in the trailer on their property past then.